At the start of the civil war in Syria, Bashar Assad was a man with many friends and allies: Iran, Hezbollah and Hamas among them. The Islamic republic maintains its support of Assad, while planning ahead for a post-Assad Syria, Nassrallah's Hezbollah continues to cooperate in spite of criticism from Lebanon – but Hamas has changed sides. The London times revealed Friday that the Gaza-based terror group is not only supporting the rebels cause, but its military wing is now training fighters from the Free Syrian Army in eastern Damascus. Diplomatic sources told the Times that the Izz ad-Din al-Qassam Brigades were training FSA units in the rebel-held neighbourhoods of Yalda, Jaramana and Babbila. This new development confirms that Hamas has completely cut the cord with the Syrian regime – which had previously hosted senior Hamas operatives – and adopted Qatar as its new patron. “The Qassam Brigades have been training units very close to Damascus. These are specialists. They are really good,” said a Western diplomat with high-level contacts in the Assad regime and the Syrian opposition who visits Damascus regularly. 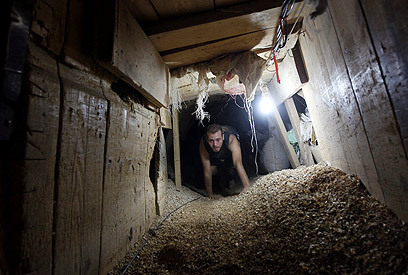 The report claims that other sources suggested that Hamas trainers were helping the FSA to dig tunnels beneath at least one contested area of Damascus in preparation for a widely expected assault on the city center. A Palestinian source from Lebanon’s Ain al-Hilweh Palestinian refugee camp said that it was common knowledge that a few hundred Hamas operatives were fighting alongside the FSA in the Yarmouk and Neirab Palestinian camps in Damascus and Aleppo, Syria’s commercial capital. Hamas has denied the claims, Osama Hamdan, a leading Hamas official based in Lebanon, said: “It’s a false thing. There are no members of Izz ad-Din al-Qassam or any members of Hamas in Syria. The Assad regime gave shelter to Hamas in Damascus from 1999 when the group was expelled from Jordan. Hamas was a component of the “axis of resistance”, the pan-regional alliance that also grouped Iran, Syria, Lebanon’s militant Shia Hezbollah and smaller Palestinian factions. However, when the uprising against the Assad regime erupted two years ago, Hamas found itself caught between its loyalty to the regime and obligations to its Palestinian supporters, who overwhelmingly sided with the Syrian opposition. Hamas decided to change sides last year. Meanwhile, another report Friday claimed that the Syrian government is sending members of its irregular militias for guerrilla combat training at a secret base in Iran, in a move to bolster its armed forces drained by two years of fighting and defections, fighters and activists said. The discreet program has been described as an open secret in some areas loyal to President Bashar Assad. See all talkbacks "Hamas training Syrian rebels in Damascus"